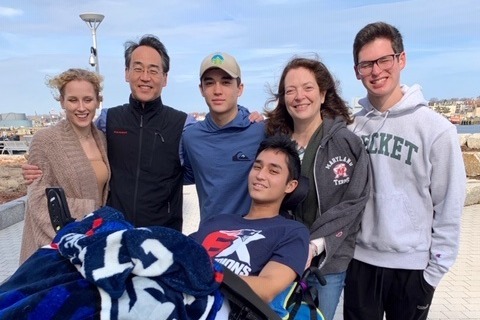 On March 3, while the eight of us were on holiday in Bali, our dear friend Ethan Wang was swimming in the ocean when he suffered a spinal cord injury that left him paralyzed from the neck down. Ethan has a C3 and C5 spinal fracture, but thankfully has not sustained any brain injuries. He was rushed to the nearest hospital, and later that evening he underwent a surgery to save his life. Three days later, he was medically evacuated to Singapore where he received a second surgery to further stabilize him. Here he was also treated for several other related medical conditions, including: a large blood clot, pneumonia and facial fractures. 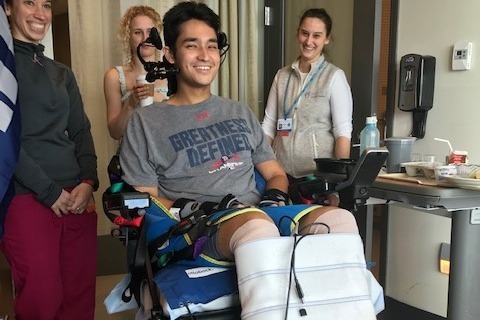 In addition to his surgeries and procedures, Ethan also endured a 32-hour flight from Singapore to Boston by way of a “Flying ICU” compartment on Lufthansa Airlines, which was operated by a US medical evacuation team. He is currently undergoing intense rehab and physical therapy at Spaulding. Ethan is 20 years old. He is junior studying Political Science at Boston University. This spring semester, he was studying abroad in Sydney, Australia when we decided to spend our spring break together in Bali. The hard work and determination Ethan shows towards his schoolwork is now being applied to his rehabilitation process. Since his accident, Ethan has regained some movement: he is able to shrug his shoulders, wiggle his wrist and slightly twist his legs. With support he can also raise his leg a bit! Ethan has been nothing but a positive force. He is a role model to all of us, and we could not have been blessed with a better friend. During our stay in the hospital, he often expressed worry about both our and his family’s well-being. It was, and still is, the most difficult experience of his life, yet he is always thinking of others. If you know E, you know this is to be expected. He is one of the most kind-hearted, and considerate people we have ever met. Whether you are a stranger or a dear loved one, he is always there to offer support, so now we are kindly asking you to offer yours. Ethan is strong and he continues to fight harder each day. His recovery will not only be long and difficult, but it will also be very expensive. Ethan is constantly worried about his loved ones and how they will cover the cost of these medical expenses, which continue to build. To relieve this worry and allow Ethan to focus on his recovery, we are reaching out to the community. We (Ethan's friends, family and Ethan, especially), would be extremely grateful if you could donate to help cover these costs, and also send your positive thoughts, vibes and prayers his way. No donation is too small. He is a fighter and he is determined to get healthy. With your love and support we can help Ethan make that happen! 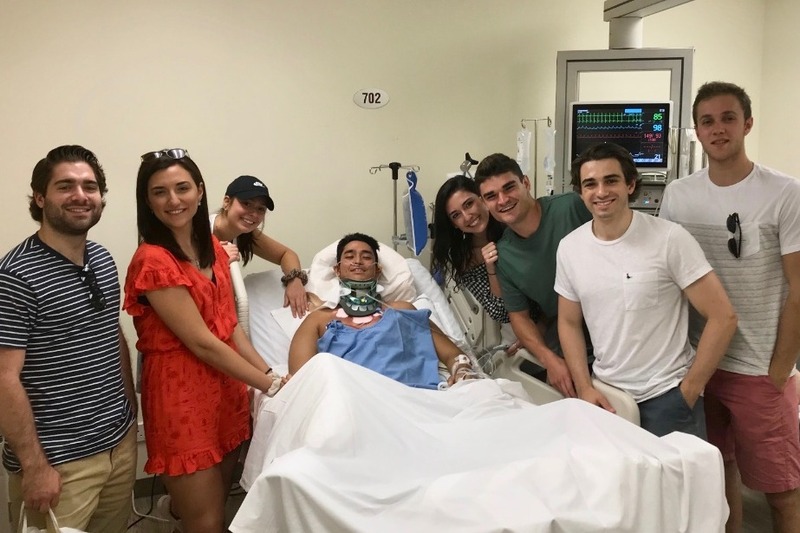 We are so overwhelmed and touched by the tremendous outpour of love, support, and encouragement expressed for Ethan from an incredible number of people from all over the world. We can’t thank you enough! We are deeply grateful for your kindness and affection. Your well wishes and generosity have lifted Ethan’s spirits, along with ours and his family’s, and inspired hope in us all. Ethan is fighting the good fight to give himself the best chances for recovery. 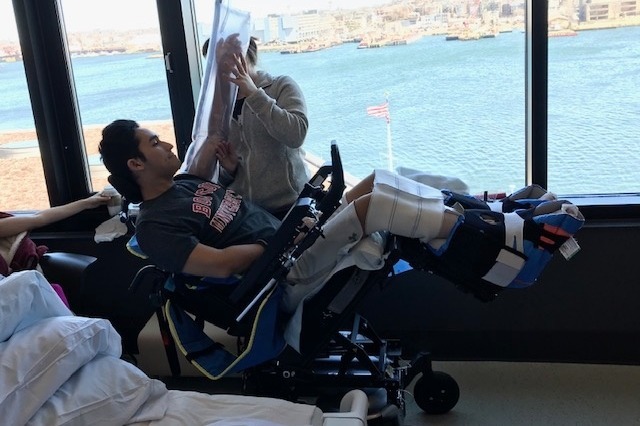 While he continues to have good days and bad days, overall since arriving at Spaulding on March 25th, he has made some progress while knowing his path ahead will be long and hard. Last week was a particularly exciting one, despite an increase in spasms affecting his therapy. Ethan was able to hold a Cheeze-It with his left index finger and thumb! He has moved to a new motorized wheelchair that he can drive using head controls and only crashed once, taking out a Purell hand dispenser . He has increased his time being fully stimulated on the FES, Functional Electric Stimulation hand-bike. 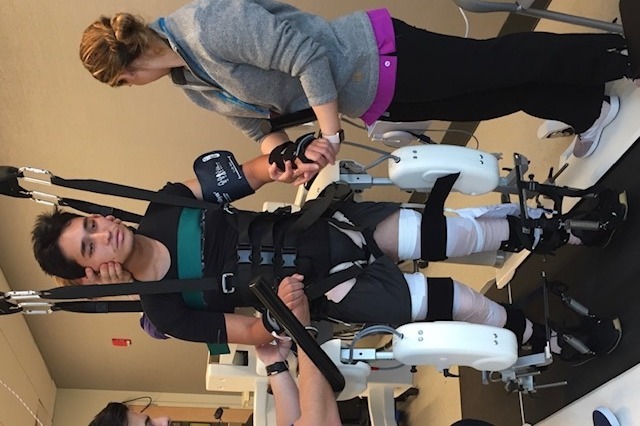 He has attempted the Lokomat gait trainer machine, which is a cool robot assisted technology used to help improve certain functional abilities of those with incomplete spinal cord injuries (SCI), like Ethan’s. It can also stimulate metabolism, stabilize circulation, and reduce spasticity, among other possible benefits for those with complete and incomplete SCI. Below are some photos that Ethan wanted us to share of his recent rehabilitation efforts. The entire team at Spaulding has been amazing. The care Ethan has been receiving from everyone there has been remarkable and so helpful. We are extremely appreciative for what they are doing for him; they are making a real positive impact. Again, thank you so much for supporting Ethan and lifting his spirits at this difficult time. He is determined to get stronger and your love is helping him mentally sustain his efforts.